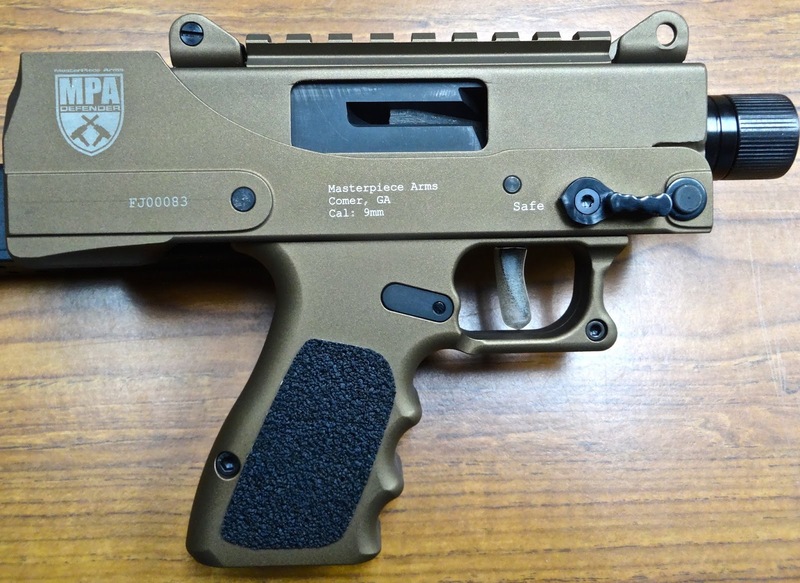 The Masterpiece Arms Defender (MPA930DMG) is a strange little pistol, reminiscent of a MAC-10. "Clunky" and probably not very accurate was my first impression upon seeing a photo of this handgun. Both of those impressions were wrong. 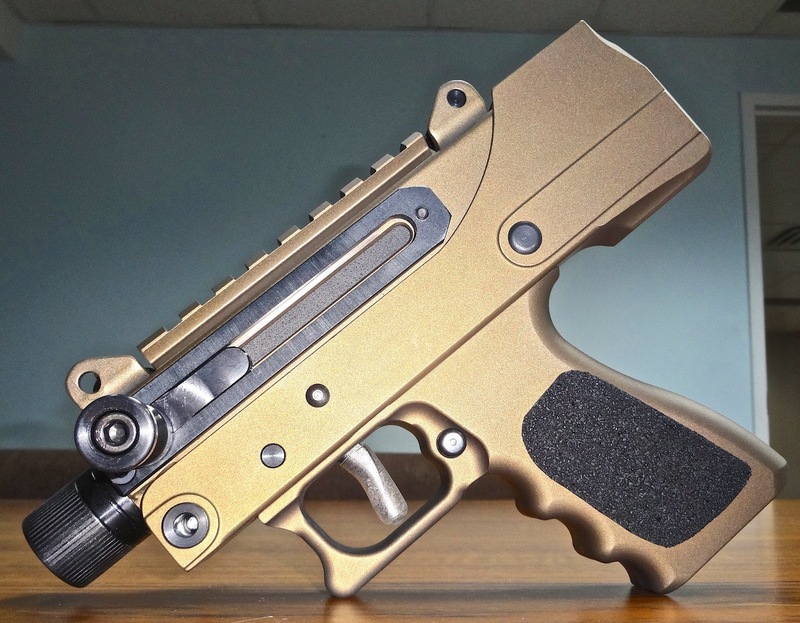 The pistol is available in Cerakote Tungsten coatings in black, dark earth brown and burnt bronze. The grip and lower are made of aluminum with non-slip decal grip panels. The angle of the grip and the generously cut finger groves make for a very ergonomic and secure hold. The Defender balances surprisingly well with a two-hand hold and the trigger pull is crisp with minimal creep with a pull of 4.8 pounds on my Lyman digital scale. The pistol has a 3.5 inch threaded barrel and a safety that is mounted in a very un-pistol like manner. 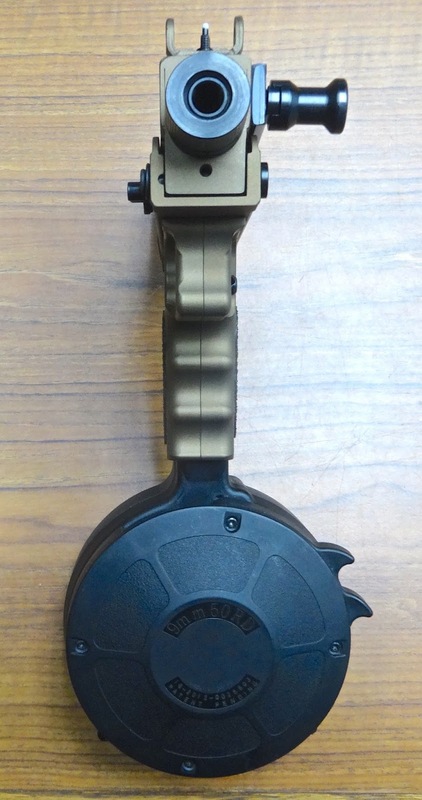 Instead of the safety being mounted on the left side of the frame in easy reach of the right thumb it is on the right side of the frame forward of the trigger. Atop the receiver is an accessory rail for mounting an optic and a set of adjustable front and rear sights. 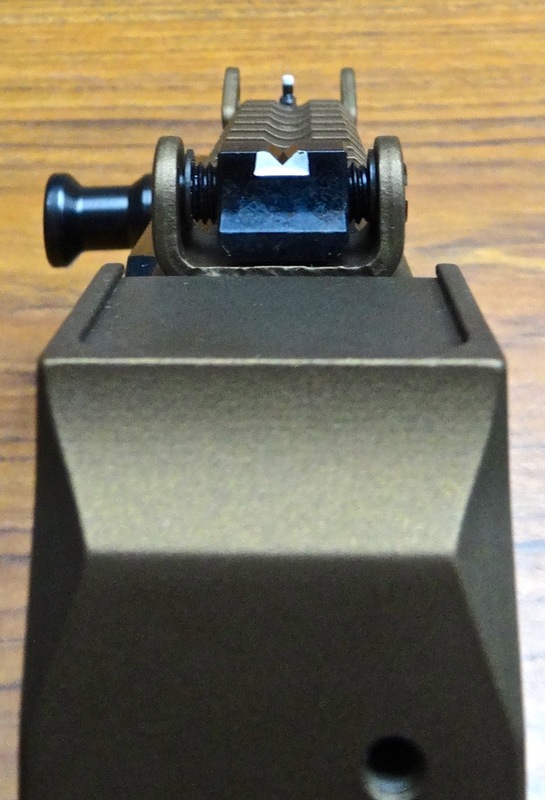 The rear sight is black with a white V-notch while the front sight is a military style black post topped in white as well. 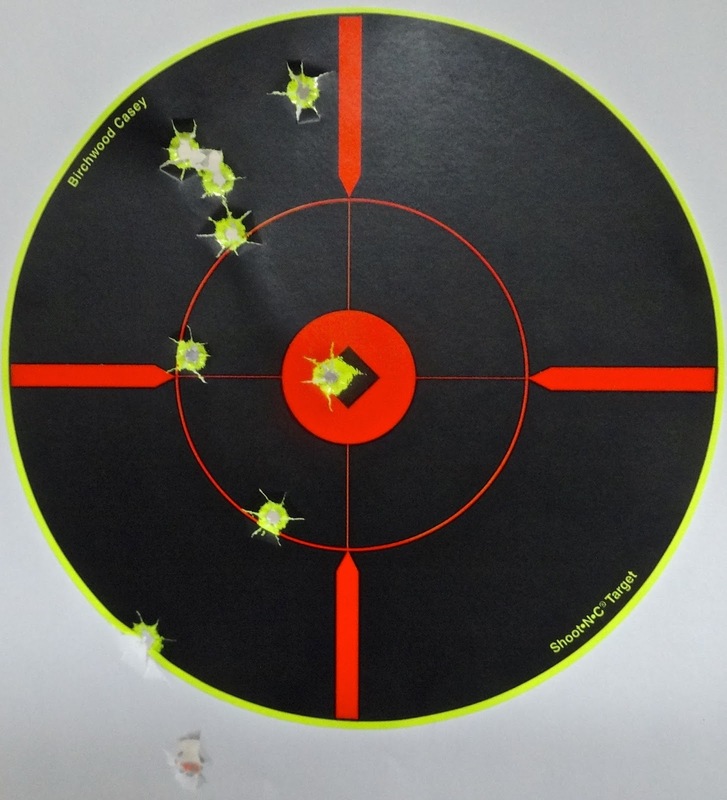 I must admit that this sight arrangement did not provide my aging eyes with a very good sight picture but the pistol proved accurate inspire of my eyesight. A piece of good news is that the MPA930DMG accepts Glock 17 magazines so you can also utilize 33 round stick mags as well as a 50 round drums. So let's look at the targets. 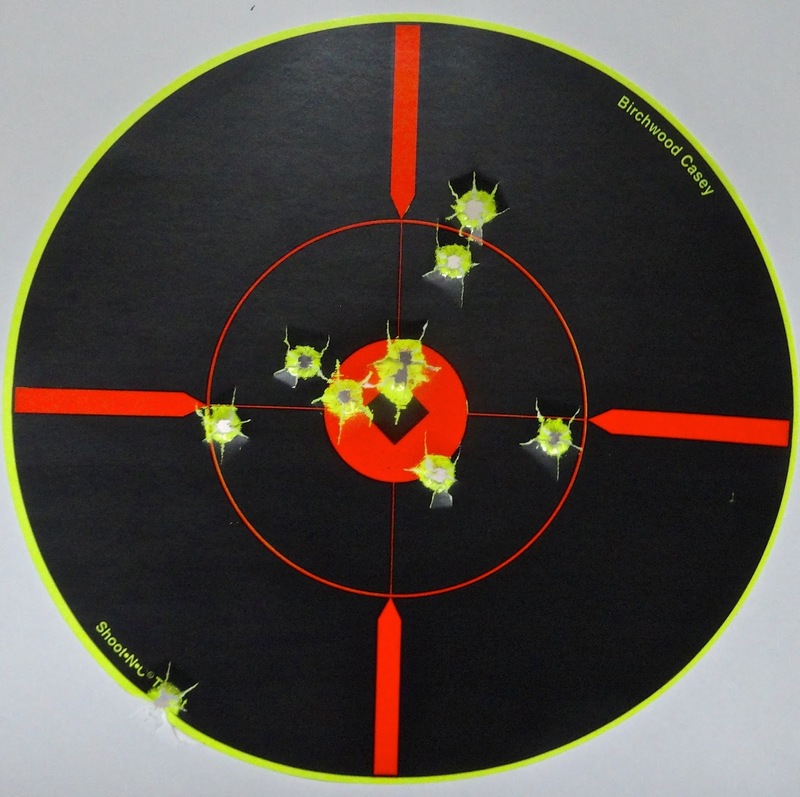 All shooting was conducted using MagTech 115 grain 9mm ammo and a standing two-handed hold on the Defender. As I mentioned the pistol is accurate. 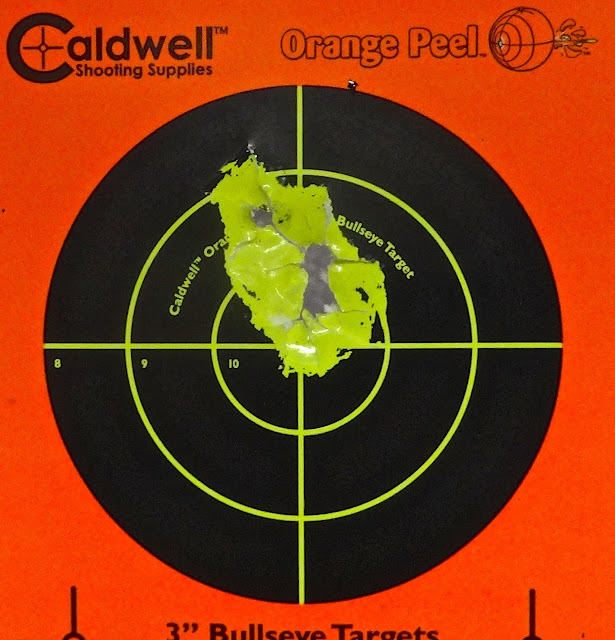 This first target shows five rounds fired on a Caldwell 3-inch Orange Peel target at 21 feet. This next target represents 10 rounds fired on an 8 inch Birchwood Casey target at 35 feet. You can begin to see the effects of the rudimentary military type sights on my aging eyes as two of the round fell outside of the 3-inch inner zone. This target shows 10 rounds fired on the 8-inch target at 50 feet. The spread got even larger with only three of the rounds hitting inside the inner 3-inch zone. 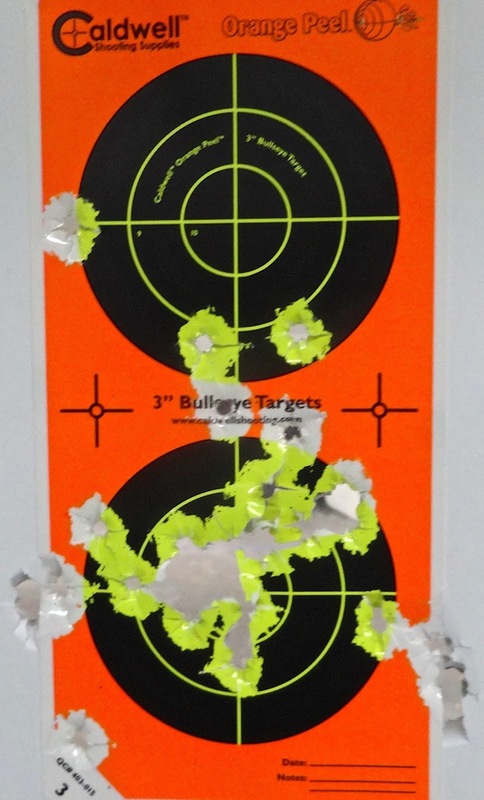 20 rounds rapid-fired at 21 feet. A 50 round drum, a suppressor and a red dot sight would make the Defender a formidable home defense weapon. Along with the defense of hearth and home, the pistol is also (and I can't emphasize this enough) extremely fun to shoot. Accuracy, balance, good ergonomics and a high magazine capacity make for a fun time at the range. For your old eyes, have you tried eyepals? I have the same problem, I am using them for a Bullseye and rapid fire league and they work very well. I don't list prices as they fluctuate by market by as much as 20%. Calling your local source is your best source of retail pricing. I'm glad they finally shipped these. Now on to a carbine.